We hope you are enjoying these first few weeks of summer. It may have taken awhile to arrive, but it’s certainly been glorious lately. As we grow, it is important to make sure that we continue to build strong processes and smooth operations to ensure the best client experience. We are pleased to announce Katie Moschella has joined Sandy Cove from SCS Financial as a Client Advisor and Director of Operations. Katie has worked with leading financial institutions in Boston and will be ensuring that we incorporate best practices across the board. Please join us in welcoming Katie to the Sandy Cove team. We have many great things happening at the Cove, including being recognized by our community for our hard work and commitment to our clients. Last week, we were named by Wicked Local’s Reader’s Choice Awards as the #1 Financial Planning firm in Hingham and #3 on the South Shore. We pride ourselves on delivering exceptional service and feel fortunate to have so many clients, advisors and friends who have acknowledged our efforts. In addition to these awards, we have received some great local exposure and recognition in feature articles in both the Boston Sunday Globe and Wicked Local. Please click on the links if you missed these articles and keep an eye out for us in South Shore Living’s annual issue of Hingham Magazine. We have also added a new member to our Investment Committee, Brian Stack. 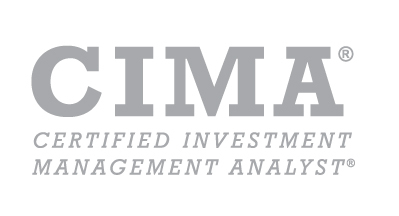 We are lucky to have so many talented, seasoned investment professionals as resources to discuss macro trends and help us filter through the myriad of investment options. Brian spent 25 years as a Fundamental Research Equity Analyst and Portfolio Manager/Analyst at Blackrock and MFS, with a primary focus on small cap and mid cap equity portfolios. At peak, he managed nearly $7 billion in small cap growth assets. Once again, we have thoughtfully compiled a list of books from all different genres for your reading pleasure this summer. Please check out our Summer Reading List. conversations around the direction of the firm, the client experience, marketing and enjoy some general team bonding. All of this while surrounded by a truly special place with people we’re fortunate to call friends and colleagues. We are poised to continue this momentum throughout 2018 and look forward to delivering exemplary service to our clients. Our goal, as always, is to offer sound investment advice, guide our clients and help simplify the management of their financial affairs. Please feel welcome to introduce us to like-minded friends, family and advisors that may benefit from our services. Wishing you and your family an enjoyable summer. For our Mid-Year update we thought it would be an appropriate time to recap market performance, discuss the latest views of our Investment Committee (IC) and introduce Brian Stack, our latest IC member. Recapping Asset Class Performance Year to Date: As the table below highlights, despite major headlines from Washington DC and the threat of a trade war, 2018 has been a relatively uneventful year for most asset classes. Both Large and Mid-Cap US stocks are up 2-3% year to date while Small Cap stocks, which are generally insulated from the effects of trade tariffs, have performed much better - posting a 7.65% return. In addition to very strong US corporate profits, the other major theme of 2018 has been the US Federal Reserve’s campaign to normalize interest rates. As the Fed has hiked rates this year, long term bonds (the kind not held by our clients) have seen some price erosion falling -1.66%. Higher US rates have led to a strong foreign demand for US Dollar denominated assets. The appreciating US Dollar has adversely affected emerging market corporations, as their goods and services have become less competitive in the global marketplace when translated into US Dollars. Emerging Markets stocks have thus given back close to 7% of last year’s outsized 37% gain. We are monitoring this asset class very closely and may look to reduce our exposure should the Dollar continue its ascent. Despite the rising US Dollar, Commodities are up close to 10% aided by a strong rally in crude oil prices. Economic & Market Update: Before the summer of 2018 kicked into high gear, the Sandy Cove Investment Committee met in late June to discuss our outlook. The best word to describe the combined thoughts of our IC is “cautious.” However, there are several positives to highlight. Economic growth has surged in 2018 and GDP growth is currently 3% or greater for the first time in three years. A boost in fiscal stimulus from tax cuts, is largely responsible for the economic surge as consumers and businesses have ramped up their spending. A growing chorus of economists believe this 3% growth level can be maintained through the second quarter of next year before the economy cools a bit. What can cool the economy, other than continued trade war issues? We will be evaluating the impact of higher interest rates, wage push inflation and mid-term elections which could pose regulatory changes. We note that we are currently experiencing one of the longest economic expansions on record, and it is important to be realistic about the continued pace of economic growth. In May, the unemployment rate fell to its lowest level (3.75%) since 1969! We may see the first time in US history where the economy slows down due to a shortage of workers. The most likely economic forecast is for one year of 3% GDP growth followed by a return to a 2% annual rate. This moderating growth scenario will likely lead to relatively healthy returns for diversified portfolios. There is a caveat to this benign picture; we have gone quite some time without experiencing a garden variety bear market. 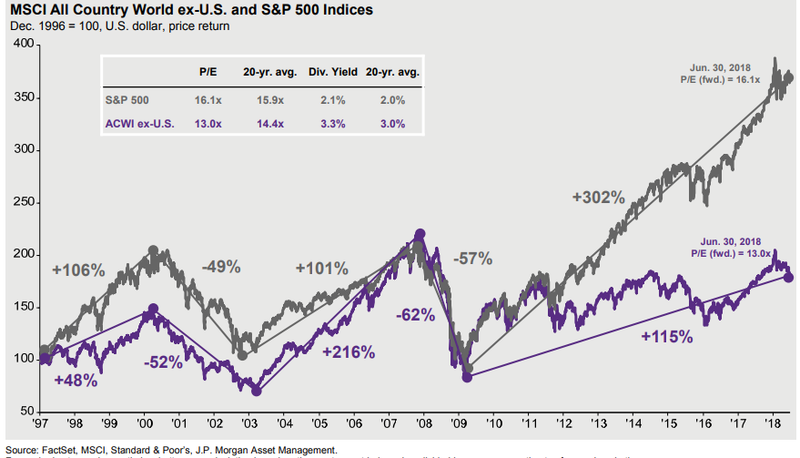 However, equity valuations are currently reasonable and in line with historic averages. Without a sizeable run up in the market, valuations are likely to improve as 2018 looks to be a very good year for corporate profits. Driven by the decrease in the corporate tax rate from 35% to 21%, earnings per share could grow by 25% this year. This is as good as it gets for US corporate profits. International corporations may have more upside leeway. 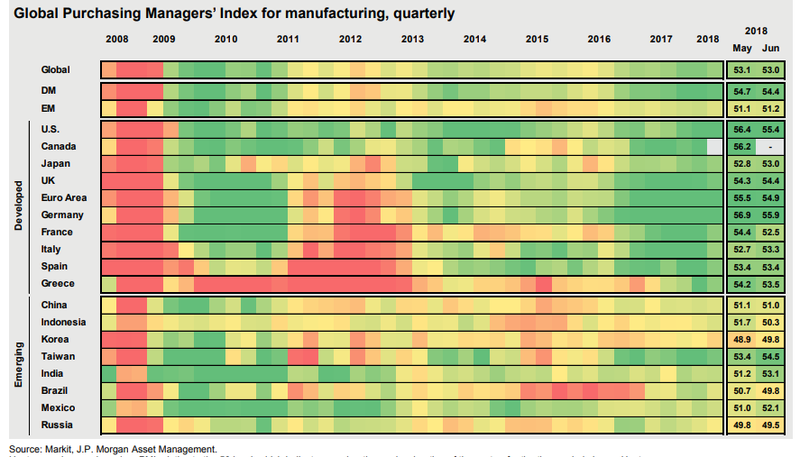 Beyond the US, the global economy looks to be in good shape as evidenced by manufacturing orders of Global Purchasing Managers which are clearly in growth mode. Green means “go” and most of the world’s economies are expanding, including emerging market economies. International equity valuations are at or below average. Over the next 18 months we believe it is important to keep bonds in focus. We expect rates (10 Year US Treasury Yield) to be at 4% at the end of 2018 and 4.5% at the end of 2019. Why is the Fed raising? The Fed’s goals have been achieved. We have economic growth of 3%, consumer inflation is north of 2% and the unemployment rate is below 4%. In addition to realizing these stated goals, the Fed may also want to raise rates to provide some monetary drag on an economy that could run too hot. Given this hawkish rate scenario, we will continue our conservative fixed income stance, keeping bond maturities short at least for the foreseeable future. The broad range of asset class returns in the table above is a great advertisement for diversified portfolios and the need for periodic rebalancing. Asset classes sell off and rally, and can be added to or trimmed accordingly. Reversion to the mean is a rule this process adheres to without emotion. The chart below is another interesting example of this maxim. It highlights the broad advance of US equities while international equities have lagged. Given the better valuations of international equities, a reversion to the mean is likely. Diversify appropriately, rebalance, repeat. In closing we want to thank our Investment Committee members especially Dan Butler, Maureen Depp and our newest member, Brian Stack, who replaces long time IC member, Kate Saltonstall, who served brilliantly for eight years. 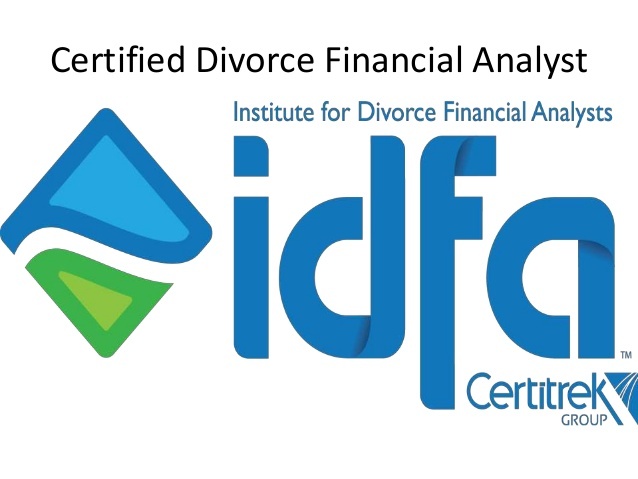 These investment professionals have blessed our process with knowledge and insights which they garnered over decades of experience managing institutional and private client assets. We will be adding Brian’s bio link shortly. Brian spent 25 years as a Fundamental Research Equity Analyst and Portfolio Manager/Analyst at Blackrock and MFS, with a primary focus on small cap and mid cap equity portfolios. At peak, he managed nearly $7 billion in small cap growth assets. (https://sandycoveadvisors.com/our-team/investment-committee). We look forward to our discussions with you in the second half. Best wishes for a fantastic and fun summer! Roth IRAs can provide you with tax-free growth potential and tax-free withdrawals in retirement. Some individuals are ineligible to contribute to a Roth IRA due to IRS-imposed income limits. However, in 2006 the law allowed for the creation of the Roth 401(K) and more and more employers are providing these high-income earners with a terrific opportunity to take advantage of Roth benefits with this option. More and more workers have a choice in their retirement plan: to put their savings in a traditional 401(k) or a Roth 401(k). What’s the difference if your employer offers both? Taxes are the key difference and a very important consideration. With a traditional 401(k), you do not pay taxes on contributions. Instead, you pay taxes when you withdraw the money in retirement. A Roth reverses that: there are no tax breaks on contributions, but the money in your Roth 401(k) grows tax free so you will not be taxed on your withdrawals – including any investment earnings – when you retire. In the following example, the individual begins investing at 30 at a 32% tax bracket, and retires at 65 in a 24% bracket. He/she contributes an annual amount of $18,500, with a rate of return of 5%. The Roth is the clear winner. Deciding between a Roth and a traditional 401(k) isn’t easy, and even experts disagree on how helpful Roths are as no situation is the same. Still, a Roth plan offers advantages for many retirement savers. Generally speaking it is more flexible than a traditional 401(k), will let you avoid taxes when you're retired, and is considered a smart move for many younger workers. However, you will give up the initial tax break on your Roth 401(k) contributions. Following are a few key questions that many people ask when determining whether a traditional or Roth 401(k), or both, might be right for them. 1. Should I contribute to a traditional or a Roth 401(k)—or both? In general, the longer you have until you retire and if you expect your tax rate in retirement to be higher than your current rate, the more likely you are to benefit from a Roth 401(k) account vs. a traditional 401(k). However, as no one can predict future tax rates, it may be prudent to contribute to both a traditional and a Roth 401(k), giving you taxable and tax-free withdrawal diversification. 2. If I have the choice of converting to a Roth 401(k) or rolling over into a Roth IRA, which is the best option? If you convert to a Roth IRA you have until October 15 of the year following the conversion to change your mind and re-characterize it back to a traditional IRA, whereas Roth 401(k) contributions are irrevocable and cannot be moved to a traditional 401(k) account. Also, Roth 401(k)s are subject to minimum distribution requirements beginning at age 70½, while Roth IRAs are not. Plus, a Roth IRA may provide additional flexibility to choose your investments, which may or may not be important to you. 3. Can I convert my entire Roth 401(k) into my Roth IRA? Only the post-tax contributions that you made to your Roth 401(k) can be rolled into a Roth IRA. If your company had a matching plan, the contributions they made would have been pre-tax and therefore would have to be rolled into a Traditional IRA. Roth Flexibility at Retirement: By law, retirees must make regular withdrawals—“required minimum distributions”—from their traditional IRA after age 70 ½. 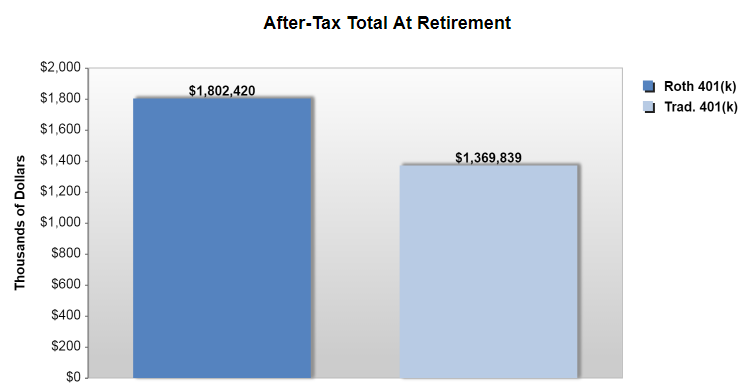 But retirees can leave assets in a Roth account (once converted from Roth 401(k)) for as long as they want. That can keep investments growing tax-free well into retirement. Similarly, if a retired couple with a Roth 401(k) or Roth account would like to withdraw a large sum from their account, they will not have to worry about the tax consequences from the large withdrawal as it is tax-free. Roth Flexibility Before Retirement: If you withdraw money from a traditional 401(k) plan before you turn 59 ½, you pay both taxes and a 10% penalty. There’s no penalty for withdrawals from a Roth 401(k), as long as you take back only the amount of your original contribution and leave any earnings in the 401(k). That can make a Roth account valuable in emergencies or if you retire early. Tax Law Changes: No one knows for sure what the U.S. tax system will look like in five years, and predicting tax rates in 30 or 40 years is just about impossible. An optimal solution to hedge your tax rate fluctuations is to use a mix of both Roth and traditional 401(k) accounts. Additional after-tax 401(k) contributions: Some 401(k) plans allow participants to make additional after-tax 401(k) contributions beyond the $18,500 deductible contribution limit (or $24,000 after age 50), up to the IRS maximum contribution limit from all sources of $55,000 (or $61,000 after age 50). Passes Tax-Free to Beneficiaries: A Roth can also be used as a way to pass an inheritance tax free to a participant’s heirs. A spouse would inherit the Roth tax free, and will not have a Required Minimum distribution (RMD). Other heirs, such as children, will have to take an RMD based on their age and the Uniform Lifetime Table. However, like their parents, these withdrawals are not currently subject to tax. Changes in legislation: Congress has been discussing Roths for some time, you may have heard the term Rothification. This refers to an idea to increase tax revenue in the short term by doing away with employer sponsored pre-tax contributions. I.e. Congress wants more Roths and isn’t likely to end the program by taxing withdrawals. Always remember that 401(k) plans can vary considerably, so before you get too far with making any changes, be sure you understand your plan's rules. As with any tax-related decision, it is important to discuss your situation with a tax and financial adviser to help you fully assess what is best for you.